"This chicken always turns out juicy and tender with robust flavor. Are you tired of the same old boring chicken? Try this one! It is so easy to prepare and cook. There are other versions that can be cooked on the grill but we prefer ours in the oven. It's a dinner our whole family loves." Mix the garlic powder, seasoned salt, onion powder, dried oregano, salt, and ground black pepper in a small bowl; set aside. Pour 1/3 of one can of beer into the bottom of a 9x13-inch baking dish. Place the open beer can in the center of the baking dish. Rinse chicken under cold running water. Discard giblets and neck from chicken; drain and pat dry. 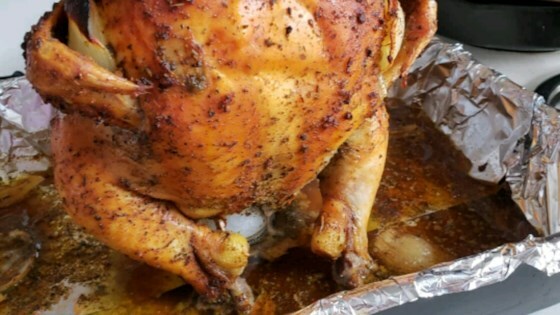 Fit whole chicken over the open beer can with the legs on the bottom. With the breast of the chicken facing you, use a paring knife to cut a small slit on each side and press the tip of each wing into the slit to encourage even cooking. Rub the prepared seasoning mixture to taste over the entire chicken. Pat the sliced green onions around the whole chicken evenly. Some will fall into the beer, that's fine. Press the halved green onions into the top cavity of the chicken. Open the remaining beer and pour 1/2 of it into the pan under then chicken. Reserve the remaining beer. Bake the chicken in the preheated oven. After 45 minutes, pour remaining beer into the pan under the chicken. Continue baking until no longer pink at the bone and the juices run clear, about 30 additional minutes. An instant-read thermometer inserted into the thickest part of the thigh, near the bone should read 180 degrees F (82 degrees C). Remove the chicken from the oven and discard the beer can. Cover the chicken with a doubled sheet of aluminum foil, and allow to rest in a warm area for 10 minutes before slicing. A whole, dry-rubbed chicken sits on a can of beer and grills to perfection. You can add to the seasonings or change the amounts to your liking. Just make sure to cover the entire chicken. These are the seasonings my family likes best. The nutrition data for this recipe includes the full amount of the beer and spice rub ingredients. The actual amount of these ingredients consumed will vary. Gread Recipe, but I changed it a little. I drank the beer, rinsed the can, and used wine in the can instead. Worked out great !!! Try with Bud Lime beer for a unique taste.